The Wine Advocate, an American publication run by the prestigious and influential wine critic Robert M. Parker, has classified Rioja’s Iñigo Amézola and Viña Amézola as “outstanding”. Iñigo Amézola 2010 (red) has been given 92 Parker points, Viña Amézola 2009 (vintage) 90 Parker points, Señorío Amézola 2007 (reserve) 89 Parker points, and Iñigo Amézola 2010 (white) 88 Parker points. It is the first time that the Rioja winery Bodegas Amézola de la Mora is critiqued by The Wine Advocate and the outstanding result reinforces the quality of the Rioja wines. Cristina and María Amézola run the winery Bodegas Amézola de la Mora and are the youngest wine-producers of the Rioja region. Despite their young age, they produce the wine the traditional way focusing on the vineyards and the soil in order to obtain great quality wines. 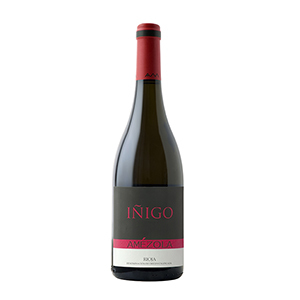 Retailing at around £30 a bottle, Iñigo Amézola 2010 spends 10 months in a barrel made out of French and American oak. With an intense cherry colour, it has a fruity aroma with the flavour of different spices. The wood, well integrated with the overripe fruit, keeps the wine fresh. Viña Amézola (vintage) 2009 retails at around £14 a bottle and spends 15 months in semi-toasted oak casks. It combines tradition with modernity, with notes of coffee, forest fruit, caramel and sweet spices. It has an intense taste with an acid touch. The Rioja winery Bodegas Amézola de la Mora is a small family business situated in Torremontalbo, Rioja. Its wines are exported to Europe, USA and China. Bodegas Amézola de la Mora have been distributing its wines in the United Kingdom for over 20 years to their faithful British consumers. Torremontalbo is a small village situated in the wine region of Rioja. The proximity to the Najerilla river marks the character of its vegetation, which is constituted mainly by river bank forests and vineyards. Its main attraction is the fortified tower that belongs to the Count of Hervías built during the XIV-XV centuries on top of a roman fortified tower. Categorías: Amezola de la Mora, Íñigo Amézola Tinto 2010, Uncategorized | Tags: Amézola de la Mora, Íñigo Amézola Blanco 2010, Íñigo Amézola Tinto 2010, robert parker | Enlace permanente. Señorío Amezola Reserva e Iñigo Amezola Tinto entran a formar parte de la prestigiosa lista Parker con los vinos de más de 90 puntos. 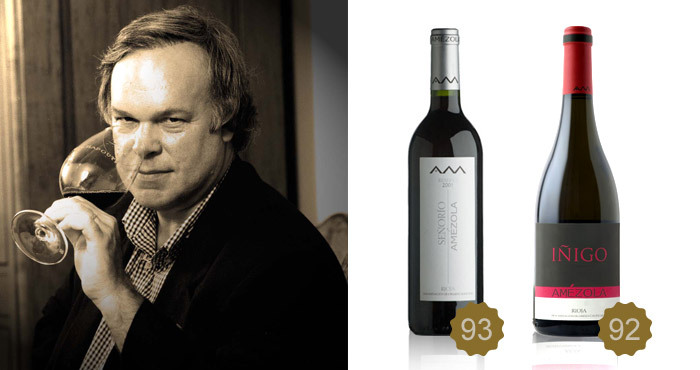 El afamado crítico norteamericano Robert Parker ha otorgado 93 puntos a nuestro Señorío Amezola Reserva 2004 y 92 puntos a nuestro Iñigo Amezola Tinto 2009. Con esta magnífica puntuación estos dos grandes vinos entran a formar parte de la exclusiva lista de vinos españoles a los que Parker ha dado puntuación de 90 puntos o más. Estas puntuaciones atestiguan y reafirman la calidad de los vinos de la marca Amezola. Elaborados con la asesoría del enólogo francés Georges Pauli y bajo la supervisión de las propietarias María y Cristina Amézola, las dos bodegueras más jóvenes de la D.O.Ca. Rioja, estos dos grandes vinos son una verdadera muestra líquida de los tesoros que encierran los pagos de Amézola de la Mora, situados en torno a la bodega en Torremontalbo. Señorío Amezola Reserva 2004 está elaborado a partir de la variedad Tempranillo y algo de Mazuelo y Graciano. Su crianza se realiza durante 22 meses en barricas francesas y americanas de tostado medio. Tiene un precioso color rojizo. Intenso y rico en matices balsámicos y regalices. Suave y aterciopelado. Sabroso y complejo. Muy elegante. Íñigo Amezola 2009 es un monovarietal de tempranillo que procede de la esmerada selección de uva con tres pasadas de la mimada Finca de San Quiles que se asoma al curso del río Najerilla a 500 metros de altitud. Su crianza se realiza durante 8 meses en barrica de roble francés totalmente nueva. Tiene un color cereza intenso. Aromas afrutados y notas especiadas. Sabroso y amplio. Largo retrogusto. Categorías: Uncategorized | Tags: aromas, rioja, robert parker | Enlace permanente.